I am most creative when…. I can't sleep. I love when... my face looks glowy and dewy and I don't need to wear makeup. Or when my hair dries nicely! My beauty regime includes…. Cleanse, tone, hydration booster, moisturiser, oil. I can’t live without… lip balm and a hair tie! My biggest beauty regret is/was... having my first spray tan (level 3) the day of my friends 18th and looking like an orange umpa lumpa. A beauty trend I’m tempted to try is... the blood facials! In my bag I have… phone, headphones, wallet, lip balm, hand sanitizer, hand cream, sunnies and tangle teezer. The last beauty product I bought was…. Tata Harper intense hydration mask. The last beauty service I tried was… Facegym. The last thing I googled... the best bath salts and where I can buy them! What inspired you when creating our signature hair style? ……… It's Festival season which means summer vibes! 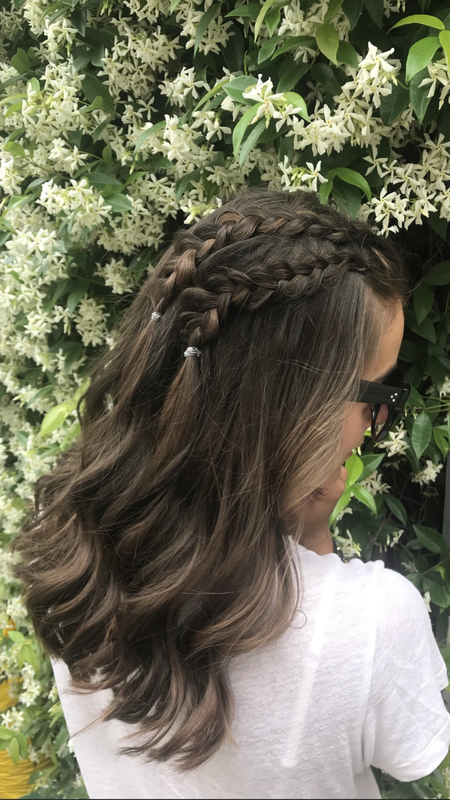 This look is so easy yet looks chic and put together, and braids are a simple way to mix up your hair look!